Words like "exquisite," "perfect," and "masterpiece" have already been heaped on Helen MacDonald's debut blend of memoir, nature-writing, and biography. While I'm usually resistant to such descriptions, I find myself regularly using them when talking about H is For Hawk. By her account, MacDonald lost more than a father when he died suddenly of a heart attack. She lost her tether -- to her world as a whole, as an aspiring academic at Cambridge; but more frighteningly still, to herself. 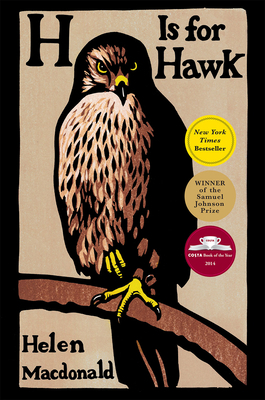 With life in something of a free-fall MacDonald sought solace from a perhaps unlikely source, a bird of prey like none other: the English goshawk. Though no novice to falconry, the sheer violence and size of the goshawk is new to MacDonald . . . and, we find, appropriate to the enormity of her deepening depression. There is a talismanic quality to this sort of writing that makes it as difficult to forget (or stop talking about!) as it is to put down. Her prose mimicking the manner of Mabel, her hawk -- expansive like a set of wings (soaring unexpectedly into a biography of T. H. White, the famed author of The Once and Future King, but known best to MacDonald for his earlier book, The Goshawk), its talons holding the reader in place, instinctively wary of everything it cannot consume -- MacDonald has crafted something truly special. H is For Hawk will appeal specifically to readers seeking a dose of depth and poetry to their reading; but more generally, too, to we who have lost someone, or who have felt ourselves at a loss for something unspeakably and identifiably ours, and are perhaps looking above and below still. There is a talismanic quality to this sort of writing that makes it as difficult to forget (or stop talking about!) as it is to put down. Her prose mimicking the manner of Mabel, her hawk -- expansive like a set of wings (soaring unexpectedly into a biography of T. H. White, the famed author of The Once and Future King, but known best to MacDonald for his earlier book, The Goshawk), its talons holding the reader in place, instinctively wary of everything it cannot consume -- MacDonald has crafted something truly special. H is For Hawk will appeal specifically to readers seeking a dose of depth and poetry to their reading; but more generally, too, to we who have lost someone, or who have felt ourselves at a loss for something unspeakably and identifiably ours, and are perhaps looking above and below still. -- Brad J.